Are you all set for back to school? Be careful of the afflictions and illnesses that may affect people of all ages at this time of year. Whether it is an itchy head, a runny nose, or sudden nausea, the appearance of these symptoms often takes us by surprise and upsets our daily life. With this in mind, this practical guide full of useful information was created to help you take better care of your loved ones. 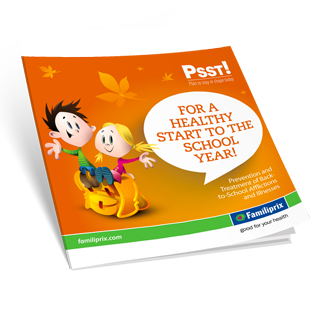 Consult it with your child, so that your entire family will be ready to face the illnesses associated with going back to school! Who is most at risk of being infested by head lice? Which children are most at risk? Do I have a cold, or is it the flu? What about cold and flu medication? What is a good night’s sleep for my child?